I am embarrassed to admit that I've never read a novel by Pam Jenoff. I actually have quite a few on my shelf, but for some unknown (and really dumb) reason, I've never picked up one. That all changed when I decided to read her latest novel THE ORPHAN'S TALE. I was fortunate enough to briefly meet her at last year's SIBA and receiving a signed copy was one of my highlights from the conference. THE ORPHAN'S TALE takes place during World War II, and you might be thinking,"Oh no! Another book that takes place during World War II?" However, I can promise you that this one is special. It tells the story of sixteen year old Noa, who has been thrown out of her house after becoming pregnant by a Nazi solder, and Astrid, a Jewish woman who is a trapeze performer in a family circus. These two women become unlikely friends and their story is guaranteed to touch your heart. After giving up her baby, Noa is living and working at a train station -- her family will have nothing to do with her. One day, she discovers a box car filled with Jew infants on their way to a concentration camp, and Noa decides to take one of the babies and runs away into the wintry night. Noa and the baby boy are taken in by a German circus, but the owner tells her she must earn her keep by becoming a trapeze artist. Astrid, a Jew who is hiding in plain sight from the Nazis, has already lost her family. She has joined up with the same German circus and is tasked with teaching Noa how to fly. The two women have some difficulties (that's putting it mildly), but eventually discover that they care deeply about each other. Their friendship allows them to share secrets with each other and even go to the ends of the earth to protect each other. I really, really enjoyed THE ORPHAN'S TALE. It's a touching story about two strong women and their friendship; however, it's also a very well researched novel that I found fascinating. As I was reading this novel, I quickly fell in love with the German circus owner who sacrificed his life to protect Jews. Little did I know that this part of the story was based on a real-life man! It was evident to me that Ms. Jenoff did a ton of research on the subject, but that she was also able to effectively incorporate the character in this novel. I also really appreciated the characters of Noa and Astrid. Astrid was a little rough around the edges at the beginning of the novel, although I totally understood why given her troubled past; and Noa was young, earnest and very sweet. As their relationship progressed and the two women shared their secrets with each other, I found myself loving both of them. They were courageous women who were willing to sacrifice everything for each other. I totally understand why Ms. Jenoff is such a popular author. She's really good! Not only did I recognize her research and character development, but I also appreciated her storytelling abilities. She wrote this novel in alternating chapters through the eyes of both Astrid and Noa. I thought she did a fantastic job of capturing each woman's voice and individual personality. In addition, I liked how she built suspense throughout the story. It was definitely a page-turner! It's probably not surprising that THE ORPHAN'S TALE would make a great book club selection. Book clubs tend to enjoy World War II novels, and this one covers two stories (the German circus owner and the box car of Jewish babies) that probably aren't familiar to them. I also think Astrid and Noa are interesting characters and their friendship is ripe for discussion, but some of the minor characters are fascinating as well. I was happy to find a reading guide with seven thought-provoking questions. Some of the themes you might want to explore further include parent/child relationships, sacrifice, love, war, circus life, the symbolism of the title, and more! Overall, I enjoyed THE ORPHAN'S TALE and highly recommend it to fans of World War II novels and fans of women's fiction! I received a copy of THE ORPHAN'S TALE at last year's SIBA. At this point I think it's pretty difficult to come up with a unique World War II storyline and it sounds like Jenoff managed to do that and do it well. I look forward to reading this! 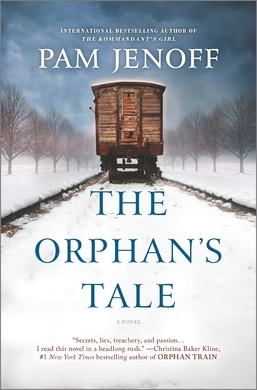 The Orphan's Tale, by Pam Jenoff - A BIG Winner! - 3/29/17). I really liked it a lot. I will hopefully read more. Kid Konnection: Fun (but Educational) Books! Kid Konnection: Cute Picture Books!